Tree limbing is not a project to rush into. Even the most ardent do-it-yourselfer will probably want to defer to the expertise of tree services on this one. The problem is, how do you locate tree services? Also, once you have located them, how do you separate the wheat from the chaff for so risky a job as tree limbing (or tree removal)? An all-purpose handyman driving around a neighborhood in a pickup truck with a chainsaw and hollering out sales pitches may not be suitable for work demanding such a high level of responsibility. For dangerous work such as this, tree services' demonstrated possession of adequate insurance may well be the consumer’s primary consideration. Request to see certificates of liability and workman’s compensation insurance, and check that they are current. Phone the insurance company to verify current policy information. Be wary of hiring tree services requesting payment in advance or who wish to begin work without having drawn up a free estimate of the cost. In fact, consumers should demand not only an estimate but also a written contract, laying out precisely what the tree limbing job entails and for how much. 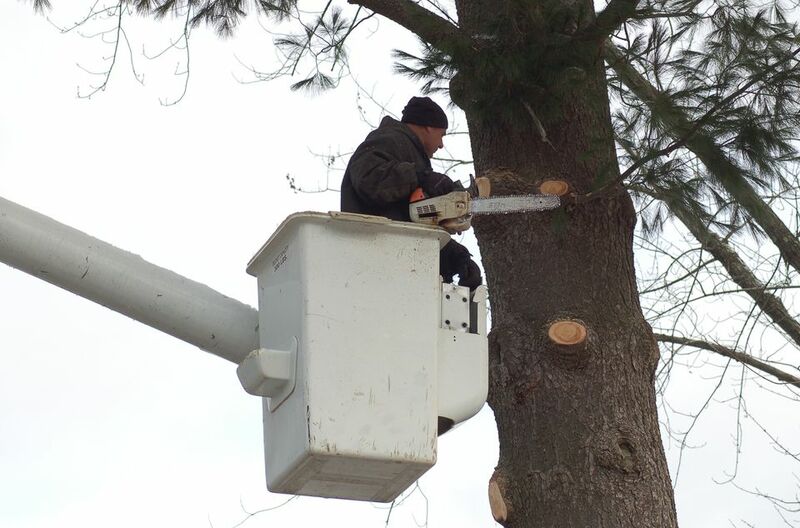 If limbing work needs to be performed on a tree whose preservation and appearance are important to you, always insist that tree services climb the tree using ropes or ascend with an aerial lift (see photo) rather than using climbing spikes. Spikes cause damage to the cambium of a tree. Nor should you let anyone talk you into topping a tree that you care about. Decide in advance exactly how much you want the tree service that you hire to do. Will they just be limbing the tree, or will they be removing the whole tree? If the latter, will they be grinding the stump, or will you be removing the tree stump yourself? If you are landscaping on a budget, some of these decisions may boil down to money. While prices will vary depending on where you live, you can generally expect to pay upwards of $1500 to have a large tree totally removed from your property. The cost of a typical limbing operation may be closer to $500. Finally, it never hurts to do some asking around on your own. Take advantage of word of mouth by striking up conversations on the subject with neighbors. If someone else in the neighborhood once had a tree limb arrive unexpectedly on the living room carpet, accompanied by a shower of glass, due to the incompetence of a tree service, chances are you will hear about it. Conversely, tree services worth hiring will benefit from word of mouth and will be glad to provide a list of phone numbers of local clients satisfied with a job well done. As when dealing with any professional who will be working around your home, do not be afraid to ask for references from tree services. What is the Best Way to Protect Japanese Maple Trees from Winter Damage?